Here are the best tools and materials for making scenery Strong, Cheap, and Fast (my 3 favorite ingredients!). GLUE!!! You can actually glue stuff together with concrete patch! It sticks to plastic (if sanded), wood, stone, cardboard, porcelain, foam... everything but metal (even then if you sand it enough). It's best for gluing large, uneven objects (like if you want to glue rocks down to a base). 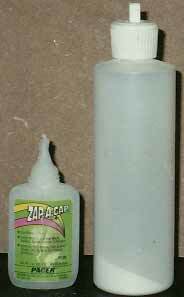 It's not a replacement for superglue (don't use it for miniatures! ), but it's really handy when making natural terrain. Filling Gaps. Especially when working on natural terrain (stone structures, dirt trenches, etc. ), just mash some into the gaps. For a cleaner finish, just wipe away the excess with a damp cloth. Great for blending together castle pieces, basing up trees or trenches, or blending rubble together. Adding Texture. Goodbye textured paint, hello concrete patch! This stuff sticks to nearly everything- even porcelain! Just dab / stipple it on to add a grainy texture that, when dry, will not crumble or flake away. You can even texture bases with it! Once cured, you can rub off any loose grains before painting, but you'll be surprised how much stays on. Building Up. Use it to represent rubble, dirt, or any other grainy surface. You can build it up in layers (caution: it can get heavy) or use it to coat over a basic shape (built up with foam, cardboard, wood, etc). Either way, your built up surface is sure to be strong- much stronger than styrofoam or even plaster. Also known as hardboard, press board, masonite, or HDF board. All I know is you can find it in most hardware / DIY stores and that it's cheap. (You can pick up a 2' x 4' sheet at Orchard Supply Hardware for about 3 bucks.) Get the 1/8" thickness, as it is plenty sturdy and easier to work with than the heavier stuff. Pegboard can also be used, though you have to hide the holes so it's a bit more work and not quite as strong. Yeah, so what's it for? 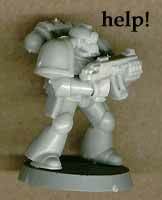 This is what you want to use for basing your terrain. It is much stronger than cardboard, and is less prone to warping. It can be glued using the same glues as cardboard (IE, white glue, superglue, concrete patch, caulk, hot glue, bubble gum, etc). If you are using Concrete Patch for filler, you want a stronger base board anyway. Okay, so how do I cut it? Well, any saw will cut through it pretty easily. Or you can actually score and snap it (like sheet styrene)-- this makes a rougher edge that can be cleaned up with a file, but is much faster than sawing all the way through. But my favorite way is to just snap it off in hunks, and then, using a heavy pair of pliers, tear away chunks of it around the edges by biting and levering upwards. This creates a ragged edge that is much more natural than the perfectly smooth, clean curves you see on most terrain bases. The picture above is of a piece that has already had the edges roughed out this way. Metal Grinder bit (in the tool above)-- good for cutting out "keyholes"- turns your moto tool into a drill saw! Hold at a slight angle to cut into plastic without having to cut from an edge. Great for making doorways, window holes, etc. Also good for making small, half round notches in things like Eldar terrain or for pipeline guides. Fiberglass reinforced Cutoff wheel (left)-- Cuts through plastic and wood quickly! You can use these to make doorways too- they give you a straighter line, but you'll have some trouble cutting the corners all the way through without overcutting (cut from the inside if you can, to hide overcuts). The fiberglass wheels last MUCH longer than the stone ones, but cost more. If you need to cut metal, use the stone wheels- they won't last any longer, but are much cheaper. (Or consider using a hacksaw instead). Drum Sander (right)-- If you need to remove material quickly, or sand a curved shape into something, this is a great tool. Use the rough sandpaper drums- the fine ones tend to clog too quickly. Like the metal grinder, it can also be used to cut half round notches into edges. Adding dents, chips, and other weathering to Metal work (best seen in one of the Space Hulk pieces and most of the Ork terrain). The only way you can really be sure a miniature will fit into the terrain you're building is to put one in there. Most models have a 1" base, so try to leave at least that much space wherever possible on your terrain. An unpainted, based, plastic marine (with backpack) is a good representative of the kind of room an average 40K model can take up. Aside from leaving enough leg room, head room, and shoulder room, it's also a good test for how stable your surface is. 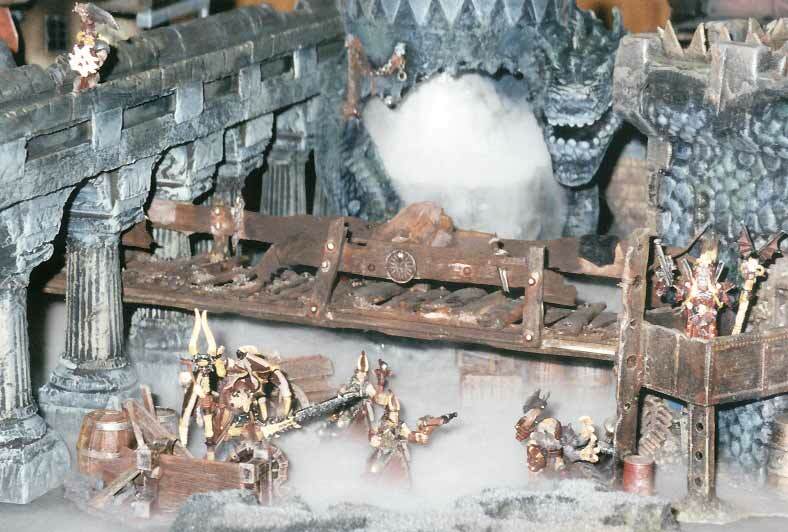 If the guy keeps diving off your terrain, consider sanding the surface down, or adding a flat plate over it, to ensure your terrain will actually be used. I keep 3 or 4 marines around at all times ('cause I keep losing them in my work). Aside from it's uses as a terrain tool, this fine-toothed, thin bladed saw is the ultimate tool for conversion work. Use it wherever you want to preserve both sides of a cut, or wherever you need a neat, clean line. If you want to save money, just buy the "blades" and don't bother with a handle (I find I get more control by gripping the blade directly anyway). Razor Saw (blades) are available in most hobby stores. TIP: When cutting through pewter, resin, or hard rubber, the blade tends to "bind", making cutting a slow, laborious process. Speed things up by rubbing some lip balm (I use Chapstick) directly onto both sides of the blade. This acts as a lubricant that helps the saw fly right through for a faster cut! If you don't have a pair of these, you don't know what you're missing! If nothing else, I have found no faster, cleaner way to remove parts from sprues. I buy mine at Radio Shack (electronics supply shop) for a mere $3.99. Use them to quickly trim off bits of plastic, lengths of wood or wire, or just about anything that will fit inside those little jaws. 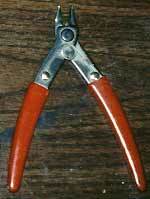 Just be careful not to cut hard metal with these, or you risk damaging the blades. Once the blades are damaged, however, keep them around for unpleasant jobs like clipping apart your Pewter miniatures. Sanding all your surfaces is helpful for more than just gluing- a sanded surface tends to hold paint better too, especially for flexible plastics and hard metals. For small parts, I use a Sanding Pad. This is a fancy word for "sandpaper on a clipboard". Buy sheets of 150 grain sandpaper from your local hardware / DIY shop and clip it onto a clipboard (available in office supply shops or stationer's). You now have the ultimate tool for making small parts flat! Any small parts that need to be glued on can be rubbed on this pad for a quick, clean sanding. You can even round the ends of parts off by rubbing them in an orbital motion on the pad. You can quickly sand strips of material by holding them down on the pad with one hand and "drawing" them through with the other hand. For large parts, you want to sand all the outer surfaces. You can use sandpaper, but it rips easily and your fingers will get tired when trying to sand large surfaces. 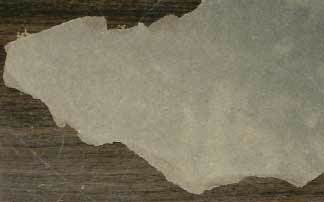 For rough or curved surfaces, use a stripping pad (below, on the left). These look kind of like scouring pads, but have abrasives bonded into them like sandpaper does! Although they will snag on sharp corners or protrusions, they are surprisingly sturdy and won't tear like sandpaper. 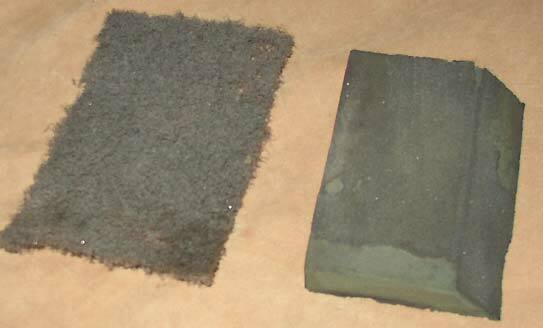 For large, smooth surfaces, use a sanding sponge (below, on the right). This is a foam rubber block or wedge with a sandpaper surface on the outside. It is easier to hold than sandpaper, and more flexible than a sanding block. Both are available in most hardware / DIY shops. Between these three options, you should have no trouble sanding surfaces quickly and easily. Easy to Form. Unlike styrofoam, foam rubber is easy to shape and to add texture- cut it with a serrated knife, or just tear it apart with your bare hands! No more hot wire cutter incidents... Once you have a general shape you like, you can add more detail just by "pinching" and tearing away small bits of it. This is a great way to make rocky crags, especially if you rip out vertical strips, forming "gullies". Note that you can buy it in any thickness, and because it starts out flat on both sides, you're guaranteed to have a nice, stable surface on top to put miniatures on, plus you can stack them to make taller formations if you wish. Easy to Paint. 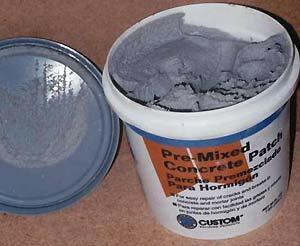 Unlike styrofoam, foam rubber will not "melt" away when you spray paint it. It even comes in a variety of colors, though you can spray it to be any color you like if you're persistant. Build up your colors in layers- for example, for crags I usually start with flat black, then add grey and brown highlights. When spraying the highlights, come at it from the sides, so only the edges that stick out the farthest catch the paint. This emphasizes any shapes you ripped into it during the forming stage. You can also "dust" it from above to highlight the top edges- this can be very effective, and very quick too! The tiny pores in the foam catch spray paint well, so you won't need to do any hand painting or drybrushing. You can paint with it too! You can use foam rubber to paint large areas quickly. Just dab the foam into your paint, and dab the foam over the area to be painted. You'll get a nice, even, grainy texture that can be put on heavy or light for different shading effects. This is much like drybrushing, but faster and easier (though not very precise). Also a good tool! When cutting sharp, pokey miniatures with a razor saw, it is often hard to hold onto the model. Try wrapping it in a piece of foam for a soft but sure grip (blister pack foam squares are great for this). Also, when bending metal parts, you can reduce "tool marks" caused by sharp plier edges by wrapping the piece in foam first. The large file above is even more versatile, as it is a file on one end and a rasp on the other. Rasps are great for removing material quickly, especially materials like wood or resin. Though the Dremel is normally the tool of choice for removing material, it generates a lot of dust- the Rasp doesn't have that problem, generating larger grains instead that are easier to clean up. Well, there you have it. I left out a bunch of great materials (it's a top TEN list, after all) so be sure to check them out too.